I know it’s been a while since I’ve blogged, but I sure hope you have taken that to mean that I have not been out birding! Quite the contrary in fact. Yeah, it’s been bitter cold – we’ve yet to rise above freezing in February! And if you hadn’t noticed, we’ve had quite a bit of snow recently. 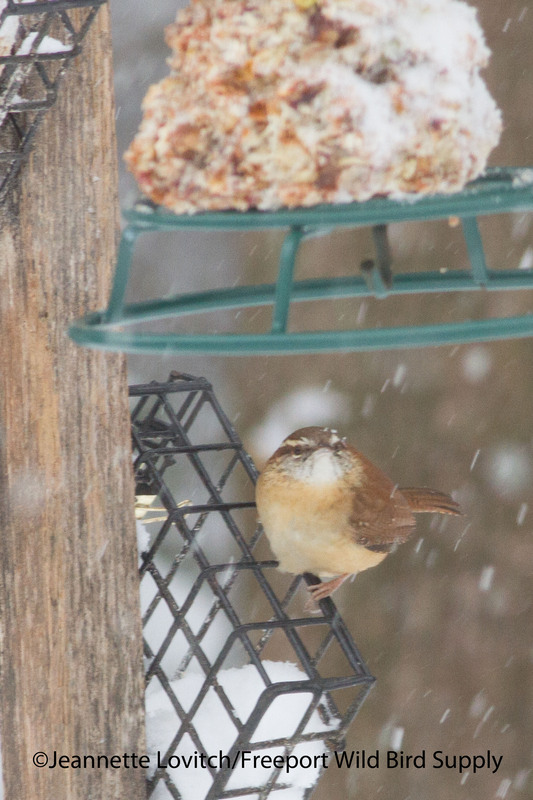 Of course, strong winds with dangerous windchills (like yesterday) and heavy snow precluded birding on some days -well, except for feeder-watching, which has been truly excellent. In fact, the feeder-watching has been so good of late, that Saturday’s birdwalk outing was mostly spent watching feeders. 50+ Common Redpolls, Pine Siskins, Purple Finches, a Carolina Wren, and more were enjoyed from a sheltered yard, or from the inside of our house. Yup, we went indoors for the birdwalk this week, defrosting for about a half hour – our feeders are only visible from inside the house, afterall. And with several snow days and work-from-home writing days of late, I have been enjoying our feeder activity: a large number of American Goldfinches have been joined by varying small numbers of Pine Siskin, Purple Finch, and Common Redpolls. Still waiting for a big flock, however. And the second-ever, and first long-staying, Carolina Wren in the yard has been a treat – we’re pumping him full of mealworms to keep him around, and healthy. The feeders at the store have been active, as well, although non-goldfinch finch numbers have not been as good or as consistent at home. But, for mid-winter with this much snow on the ground, the diversity has been surprisingly good. (Weekly totals are posted to our store’s website). Snowy Owls are around, and on 1/31 we finally added one to our all-time Saturday Morning Birdwalk list with a visit to Brunswick Landing: species #236. Meanwhile, our birdwalk to Winslow Park on 2/7 had Barred Owl, the continuing (despite all the ice) over-wintering Dunlin (12), and the 4 Barrow’s Goldeneyes (3 drakes and 1 hen) that had been present. But the impressive ice cover in Casco Bay has greatly reduced the amount of waterfowl in the immediate vicinity over the last couple of weeks. The end of Winslow remains clear (barely) and the duck concentrations there are quite good, but as of today, however, the much-reduced area of open water now held only two drake Barrow’s Goldeneyes. Meanwhile, the small hole of open water at the base of the Lower Falls in Yarmouth is still somehow still hosting the merganser “hat-trick” (with varying numbers of all three species) as it does every winter – they’re running out of room though! Not all ducks are quite as concentrated as these hungry Mallards (with a few American Black Ducks) at Riverbank Park in Westbrook. While the field trip portion of my Gull Identification Workshop has been postponed for the last two Sundays, gull-watching is pretty good right now, especially in and around Portland Harbor. Hatch Hill Landfill in Augusta on the 12th, however, had only about 100 Herring Gulls – gull numbers are drastically reduced here when there is little open water on the Kennebec River in downtown. The Bath Landfill is hosting a few Iceland and a couple of Glaucous Gulls, however. Frugivores have been common, with large flocks of American Robins and goodly numbers of Cedar Waxwings stripping all available, palatable fruit. Bohemian Waxwings have been scattered about – although I have yet to catch up with any – but so far Pine Grosbeaks have mostly remained to our north. The rapidly diminishing fruit crop locally will likely concentrate these birds further, or push them southward. Not only did I find 14 crossbills, but many were in full song, and one male was apparently carrying nesting material! A light wind, and my huffing-and-puffing from snowshoeing in waist-deep snow drifts off trail, impeded the clarity of my recordings, unfortunately. However, one of the call types (as analyzed by Matt Young over at Cornell) was suggestive of the Type 8 Red Crossbill from Newfoundland, which has yet to be definitively recorded outside of that province. Intriguing -yup, I need to find time to go back and improve the recording. The icing on the cake that day was a Hoary Redpoll teased out from a flock of about 40 Commons as they alighted in fed in the Pitch Pines with the crossbills. This was my first Hoary in Maine away from a feeder. With all of these storms, and two “nice” days of northeasterly winds, I had alcids on my mind as Lois Gerke and I spent the morning in Cape Elizabeth on Friday (2/13). Apparently, my hunch was correct – we scored 4 species of alcids! This is not an easy feet in winter in Maine, although I have hit the total several times (not yet hit 5, however). Black Guillemots were scattered about, as usual, but the fun started with a fly-by Dovekie at Dyer Point. A continuing (and apparently not very healthy) Thick-billed Murre was at nearby Kettle Cove. 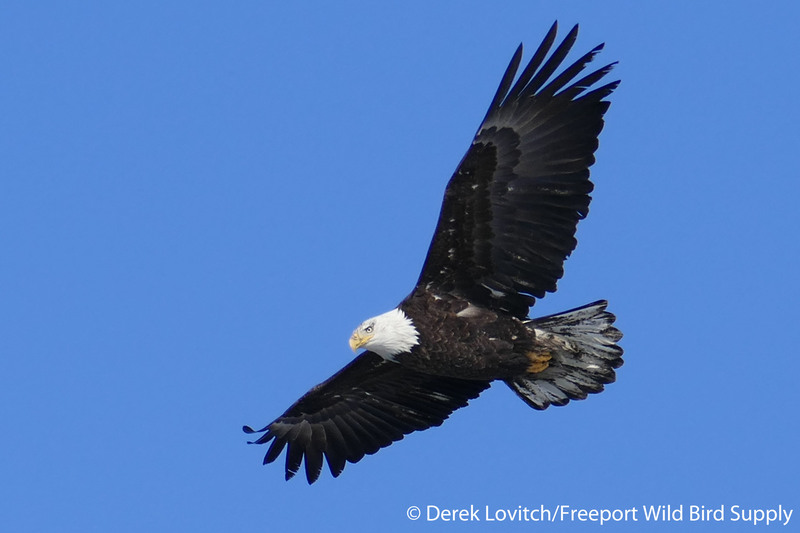 Our presence likely saved its life for now, as a 4th-cycle Bald Eagle had its eye on it – but also, us, apparently. The eagle even landed on the rocks a few inches from the murre, which, instead of diving to escape as a healthy alcid would, was apparently resigned to simply tucking itself into a corner of the rock. After checking for frugivores at Village Crossings (just a few American Robins on what was left of the crabapple, but we did enjoy a flock of 22 Common Redpolls), we decided to try for a Razorbill for our fourth alcid of the day. Lois’s time was limited, so instead of heading back down to Dyer Point (where the wind was also brutal), we rolled the dice and tried Portland Head Light. 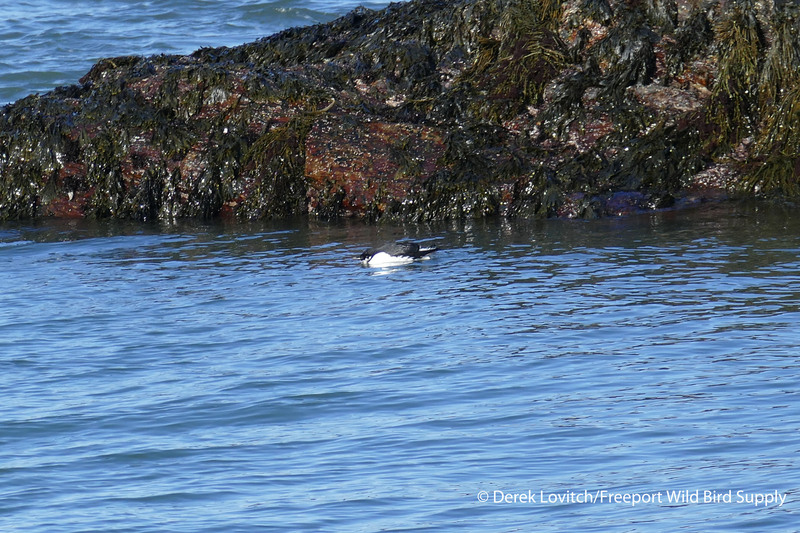 And sure enough, a Razorbill was offshore, feeding at the mouth of Casco Bay on the changing tide! After lunch, I decided to procrastinate a little longer and slowly bird my way to the store, checking for open water on the Falmouth Foreside coastline. 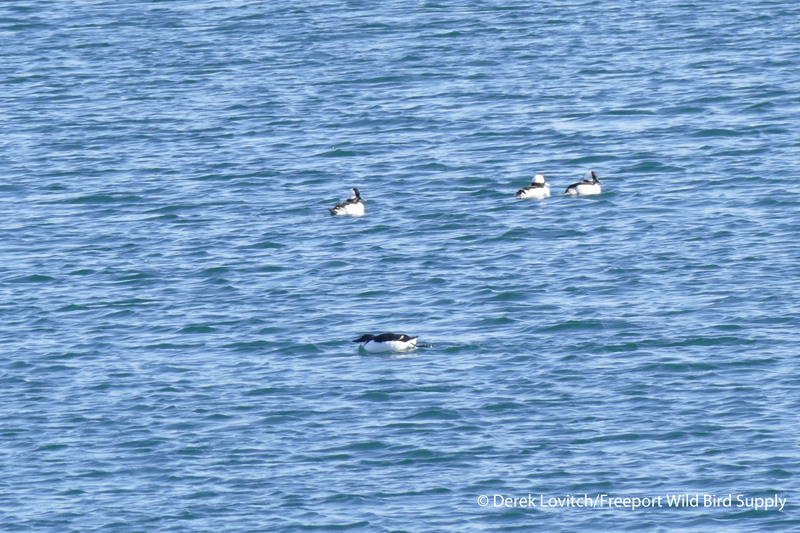 Although I was looking for duck concentrations, once again, alcids stole the show: a Thick-billed Murre flew into the cove on the south side of the Mackworth Island causeway. Perfectly strong and healthy, this bird was likely following some small fish into the bay on the incoming tide. 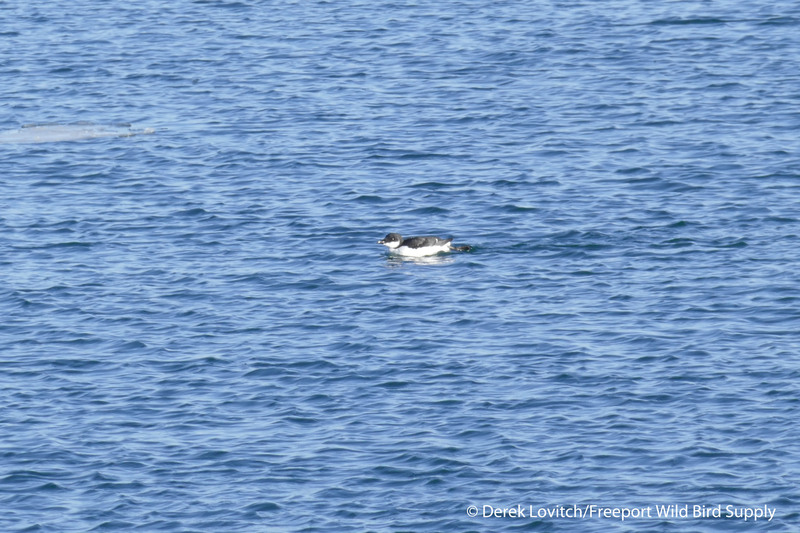 Even more surprising was another Thick-billed Murre in Falmouth, even further up the bay off of the Town Landing. This bird also looked fine, swimming steadily upstream with the tide, “snorkeling” to look for food. These Buffleheads looked just as surprised as I was. So yeah, a 4-alcid day, with three different Thick-billed Murres in quite a day, and probably one of my best birding days of the winter. 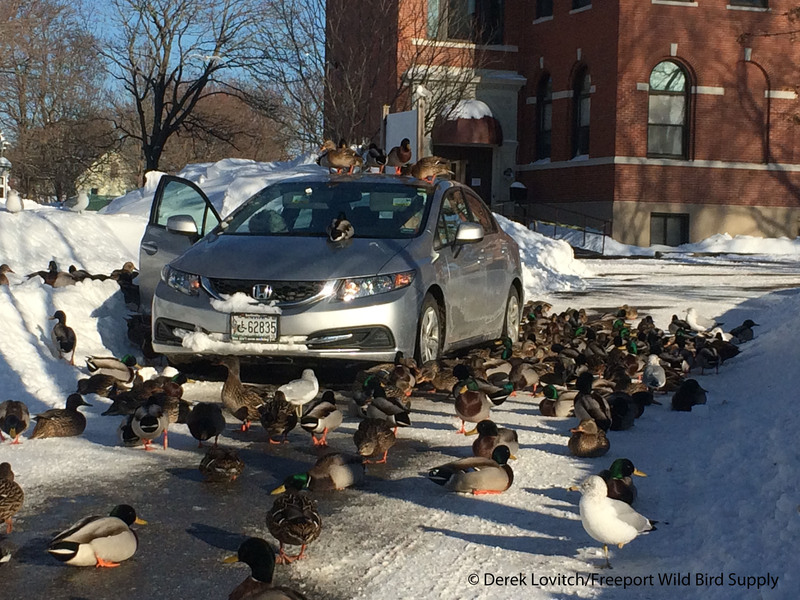 It just goes to show you what winter birding can bring in Maine, even during an impressive deep-freeze. So yeah, I’ll be out birding as much as I can, and signs of spring are certainly in the air: woodpeckers are drumming actively, Tufted Titmice and White-breasted Nuthatches are singing frequently now, and Great Horned Owls are already nesting. 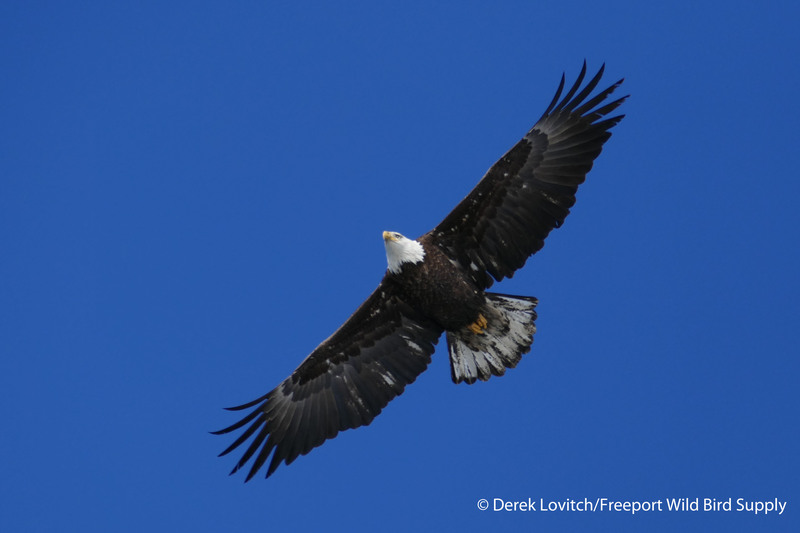 Bald Eagles are probably starting some house-keeping, Common Ravens are reaffirming territories, and in only a month, the Bradbury Mountain Spring Hawkwatch gets underway! Until then, it’s finches, ducks, white-winged gulls, frugivores, and alcids. I’ll be out in the field, and I hope you will be too. (And don’t forget, you can check out what I have been seeing in near-daily posts to our store’s Facebook page). This entry was posted in Birding in Maine and tagged "Birds, Birding, Cape Elizabeth, Carolina Wren, Common Redpoll, Dovekie, ducks, Dyer Point, Falmouth, feeders, Finches, Freeport, Freeport Wild Bird Supply, frugivores, Hoary Redpoll, Kettle Cove, Maine, Mallard, Pownal, Red Crossbill, Thick-billed Murre, Waterboro, Weather, winter on February 16, 2015 by Derek. I’ve spent each of the last three mornings at Sandy Point, and it is a rare treat indeed (but not for my neck!) that the winds tonight will likely be conducive to yet another morning in my “other office.” Yesterday’s moderate flight produced two Patch Birds: Western Kingbird and Gray-cheeked Thrush while today’s better than expected flight yielded 15 species of warblers. (Tallies from both days are on our store’s Facebook Page as always). While I can’t believe there are more Northern Parulas left to migrate through, I am optimistic about tomorrow morning. The upper-level low spinning over Atlantic Canada that has produced rain to our northeast and the clouds overhead that have reduced the flight – and my ability to identify it! – is expected to move out, and I wonder if that will open up another wave of birds to head south from that region. It is exceedingly rare for me to have four days in a row of good Morning Flights at Sandy Point, so I look forward to another early start tomorrow. With each passing flight, the changing season is becoming more obvious. Fewer early warblers and growing numbers of Yellow-rumps and sparrows, for example. And of course, as a season progresses, we birders often think ahead to the next season. The near-complete dearth of Red-breasted Nuthatches, Purple Finches, and Pine Siskins (zero) that have passed SandyPoint is an early indicator that it will be an “off” winter for northern finches as expected. Few Blue Jays and Black-capped Chickadees passing through also suggest an abundance of food to our north. These observations reflect what I am seeing elsewhere in Maine, and reflect the information contained in this year’s “Winter Finch Forecast” by Ron Pittaway that just came out this week. This venerable resource is posted each fall, and reflects a lot of effort by the author to bring together various tidbits of information. Its arrival each fall is highly anticipated – even if it does not portend the arrival of lots of highly anticipated finches. But today, I wanted to take a moment to discuss one of the local issues that we have decided to wade into. As most Portland – at least – residents may know, there is a proposal to transfer a portion of Congress Square Park to private development for a conference center. The city needs a conference center, and the park needs some attention. I’ll leave it to the residents of Portland to weigh the costs and benefits of this particular plan, but one aspect that concerns me greatly is the current blueprints that show a massive glass wall facing a smaller park with limited vegetation. Here’s a link to what I believe to be the most recent development proposal; I don’t think any significant updates have been made. Jeannette and I believe that we can use our store as a vehicle to promote bird conservation, and although we certainly don’t stick our nose into every project, sometimes we feel that we need to be the voice for birds, birding, and bird conservation. Capisic Pond Park, the Eastern Promenade, Sandy Point, and now development at the fringes of Florida Lake have been projects we have worked on. While we may not go too much further with our efforts in this case, we thought it was best to offer expertise to point out a potential issue with this projects design. I have sent this letter to city officials and the new group, Friends of Congress Square Park. I post it here for your information, and if anyone has suggestions on whom else to send this to, don’t hesitate to let us know. I am writing you today not to take a stand for or against the current proposal at this time, but instead to bring to your attention a couple of aspects of urban parks, construction, and wildlife interactions that has raised a significant amount of concern with me. First, a little bit of background. 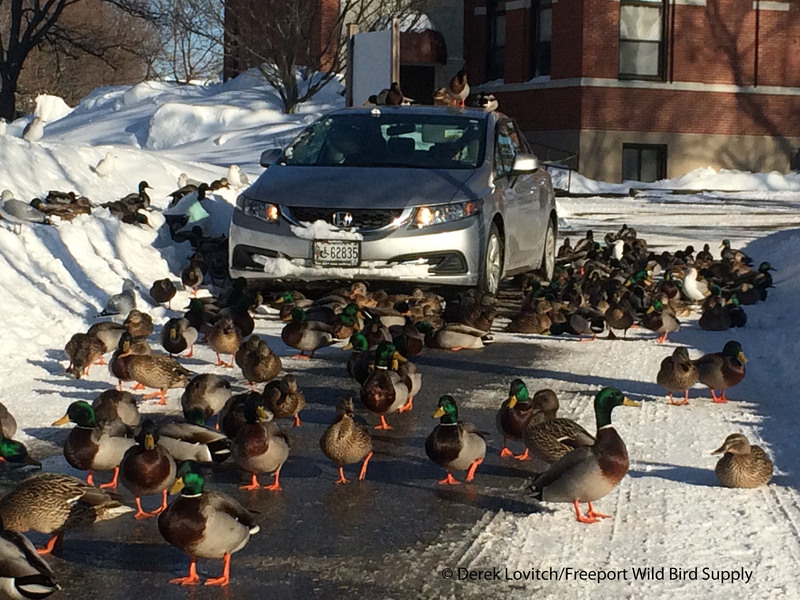 Migrating birds that stream over Portland every spring and fall face a myriad of risks. Many of our favorite songbirds, such as warblers, orioles, and tanagers all fly at night. For reasons unknown – likely due to the use of stars for navigation – birds can become disoriented by lights. Lights on communication towers, lights on buildings, lights at stadiums, lights left on in office buildings, and even lights in people’s homes. Especially on cloudy and foggy nights, birds will be drawn to this artificial lighting, and many will meet an untimely death as they collide with structures or even drop dead from exhaustion as their bodies metabolize their muscles in order to fuel the last gasps of flight as the bird circles, and circles, and circles, confused by the light, drawn in by its grasp. The cumulative light pollution of cities, towns, and even single-family homes, results in perhaps hundreds of millions of deaths of migrating birds each year. However, not every bird disoriented by city lights will die. Some find refuge in a well-landscaped park and find enough food to survive, refuel, and eventually move on. Most others find just enough refuge to move on come sunrise, when the direction of the sunrise and visual landmarks can usher a bird in the right direction. In order to avoid predators, many of these birds will fly low through the city streets, dropping in to the next tree, the next park, or even the next garden as these birds – in what is termed “redetermined migration” attempt to correct for the errors of their ways overnight. These errors could result from disorientation from lights, “groundings” from severe weather, or even from drifting too far on strong winds behind a cold front. Especially for those birds exhausted from their travels or their disorientation, every single tree in an urban environment can be a life-saver. A place to rest, a place to forage for just a little food or at the very least a place to avoid predators. Working from some part of the city, the birds will work their way inland (in the case of a coastal city such as Portland) looking for more extensive habitat where they can refuel. I have watched flocks of White-throated Sparrows winging it down side streets, landing in potted plants at the first sight of a possible threat. I’ve seen an American Woodcock walking down a sidewalk near Monument Square. I have seen waves of Blackpoll Warblers streaking by just over the treetops of Deering Oaks Park. As the birds work their way to quality habitat, such as Evergreen Cemetery, many of these birds are more than strong enough to avoid predators, avoid traffic, and fly at full speed over the course of the first couple of hours of daylight. The migrant lays still on the sidewalk; dead. It has hit a window. It has flown hundreds of miles from the forests of Canada. It has survived ever-changing weather, dodged hawks at every turn, and found enough food to pack on enough fat to fuel an epic journey to the rainforests of South America for the winter. A shift in the wind the prior night resulted in foggy conditions as it arrived in the airspace over Portland. Attempting to orient itself, it circles the red blinking light on the top of a building until it is too tired. But this bird is lucky. Below this building there is a small park with a handful of trees. Good enough, and the bird alights. The sun rises, and the bird, not finding much food in a few ornamental plantings, decides to head further inland. Flying from tree to tree, the bird sees the next tree just ahead. But that tree was only a reflection in glass. Its journey ends. Glass kills as many as 1 billion birds per year in North America. Urban light pollution may kill as many as 31 million birds per year. Lighted communication towers may kill upwards of 100 million. Only free-roaming cats are estimated to kill more birds per year than any of these other anthropogenic causes. You can see why glass in lighted urban areas is such a problem. The current proposal for a new Event Center in what is now Congress Square Park includes a massive glass façade, with “doors” that open, putting glass walls out at multiple angles. All of this glass will be reflective. Architects and admirers like that about glass. But whatever trees remain will be reflected by that glass. Thud. Another migrant is dead. How many dead birds will people pick up on the sidewalk before anyone takes notice? Or will the rats clean up the mess before the morning rush? Is the new CongressSquareEventCenter going to be a death trap for exhausted and confused migrants? Probably. Can this risk be minimized or avoided? Yes. Does anyone care? That, to me, is always the toughest question. But there are solutions out there. There are treatments that make glass less-reflective, or ways to break up the reflection so birds will not be drawn to it. Glass can be positioned to reflect the ground, and trees can be positioned to minimize reflection. There are certainly plenty of materials that don’t cast a reflection as well. There are even city-wide efforts to reduce bird collisions that range from lighting standards to simple programs to get people to turn off the lights as they leave their office for the night. My only goal with this letter is to raise awareness about a significant problem, but one that might well be avoided. I sincerely hope that you will recognize my concerns and take them under consideration. I would be happy to offer more first-hand observations to describe why this issue is real in Portland, and why a glass façade facing some of the few trees that exist in the center of an urban area could result in significant avian mortality. This entry was posted in Bird Conservation, Birding in Maine and tagged Advocacy, bird conservation, bird strikes, Birding, Congress Square Park, Cousins Island, Finches, glass, Issues, migration, Morning flight, Portland, radar, Sandy Point, Winter Finch Forcast, Winter finches, Yarmouth on September 25, 2013 by Derek.